The "Accademia del Belcanto "Rodolfo Celletti" in Martina Franca is promoted and organised by the "Fondazione Paolo Grassi", in collaboration with the Festival della Valle d'Itria. It was set up in 2010 to provide young lyrical singers with a highly specialised training on the various aspects of vocal technique and performance of Italian Belcanto repertoire (from Monteverdi to proto-Romanticism), comprising of analysis and practice of the various styles of Western music theatre, including expressions of modernity. The course also includes various practical workshops, applied to specific Belcanto techniques and aesthetics: from seventeenth-century "recitar cantando" to expressions of the Apulian and Neapolitan school; from coloratura techniques to variations in early nineteenth-century Italian Belcanto tradition. During the 2015 edition of the Festival della Valle d’Itria, students will have the opportunity of gaining specific practical experience, thus enriching their training. They will be guided by great supervisors, prominent interpreters and concert-masters. Particular importance will also be given to physical and acting training, and to correct, accurate Italian diction – necessary characteristics for today’s ‘acting singers’ engaged in conveying the essential theatrical dimension of opera. Starting from 2015, the Academy’s academic scheme also includes a module specialising in in-depth analysis of Baroque Belcanto, with prestigious master-classes and valuable one-to-one lessons for young performers with a particular interest in, and inclination towards, this kind of repertoire. This specific, personalised course is enriched with opportunities for practical work experiences during the 2015 edition of the Festival. Alberto Triola, the artistic director of the Festival della Valle d’Itria and of the ‘Accademia del Belcanto’, will convene the activities of internationally renowned teachers and artists. • the third session (from 8th to 28th June 2015) will be dedicated to specific study. 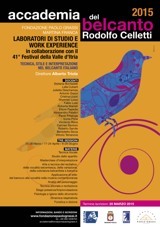 A selection of students identified as suited for the position will engage in a phase of practical work experience within the 41st edition of the Festival della Valle d’Itria (www.festivaldellavalleditria.it). Teachers: Stefania Bonfadelli, Lella Cuberli, Juliette Deschamps, Antonio Greco, Cristina Liuzzi, Sherman Lowe, Fabio Luisi, Roberta Mameli, Ettore Papadia, Alessandro Patalini, Paola Pittaluga, Sonia Prina, Vincenzo Rana, Carmen Santoro, Roberto Servile, Benedetto Sicca, Vittorio Terranova. Places for this course are limited: admission is subject to selection procedures. The selection of the candidates will be carried out by the Judging Panel (presided by the Director of the Academy) on the basis of demonstrable qualifications and after a public audition which will be held in Martina Franca at the "Fondazione Paolo Grassi" (where the Academy is based), on the first day of the preparatory session (Friday 20th March 2015, 11am). Details of the convocation for the audition will be communicated directly to the candidates. The Artistic Director has the right to admit to the courses singers who, during ex-tempore competitions or auditions, have shown artistic merit and a particular predisposition towards the Belcanto repertoire. There are up to twenty-five places available for the course. The students who have not passed the selection can still attend training activities as listeners, and they may take the place of selected students in case any should drop out. Upon admission to the course, non-EU candidates must comply with requisites of the current legislation, as failing to do so may ultimately result in exclusion from the course. •	professional experience in the field of opera theatre, through participation in artistically significant operas and concerts, which will be evaluated by the judging panel. The judges’ selection and decision is final. The selection is open to applicants no older than 32 years old (for sopranos/tenors) and 35 years old (for mezzo-sopranos/ contraltos/baritones/basses). Exceptions for particular merit may apply. For the audition, candidates should prepare three operatic arias inclusive of recitative and cabaletta (where applicable) in the original key; one aria must come from early nineteenth-century Italian operatic repertoire. It is advisable, but not compulsory, to also prepare an aria from seventeenth-century repertoire. The examining Committee has the right to choose whether to listen to the whole or only part of the programme indicated in the application. Medium-difficulty first-sight music reading may also be requested. For the auditions we will be happy to provide a collaborating maestro for piano accompaniment. It is the candidate’s right to be accompanied on the piano by his/her accompanying maestro, whose expenses are, however, to be paid entirely by the candidate. The candidate must send a copy of the scores for each piece of his/her programme to the ‘Fondazione Paolo Grassi’ (via post or e-mail), before the date of the audition. • Reason for payment: "Quota partecipazione selezione Accademia del Belcanto - A.F. 2015"
A copy of the receipt must be sent to the "Fondazione Paolo Grassi" by the convocation date. This can be done either by fax to the following number: +39 080 4805120, or by e-mail to the following address: accademia@fondazionepaolograssi.it. Alternatively, the receipt may be handed in personally on the day of the audition. Admission will not be granted to candidates who have failed to pay the participation fee. If the candidate fails to turn up for the audition, the fee will not be reimbursed. Auditions by invitation are exempted from paying the fee. STUDENTS WHO HAVE SUCCESSFULLY BEEN ADMITTED TO THE COURSE DURING THE AUDITIONS MUST COMMIT TO PARTICIPATE TO THE ENTIRE ACADEMIC YEAR: THAT IS, THE THREE STUDY SESSIONS OF THE PROGRAMME. •	€ 500,00 (five hundred/00) for the 3rd session. •	€ 80,00 (eighty/00) for the 2nd session. •	€ 150,00 (one hundred and fifty/00) for the 3rd session. Should the student (whether admitted to the courses as an actual participant or as a listener) fail to complete the Course for reasons not attributable to the organisation, he/she will not be entitled to reimbursement of the enrolment fee. No candidate will be admitted to the course without having paid the tuition fee. Lessons will take place mainly at the "Fondazione Paolo Grassi" in Martina Franca. Practical work experience will take place, apart from the above-mentioned location, in the areas dedicated to the Festival della Valle d’Itria. Staff of the "Fondazione Paolo Grassi" and the Artistic Direction will be happy to help with indications and support with solutions for accommodation at established rates. The students selected to take part in the 41st edition of the Festival della Valle d’Itria will be signed up by the Direction of the Festival; they will be entitled to a collaboration contract, and will be paid according to the level of engagement required by their role. At the end of the courses, the "Accademia del Belcanto" will issue an attendance certificate for those students (both active and listeners) who have successfully completed the course. Accademia del Belcanto "Rodolfo Celletti"